When my daughter, Rosemary, lost interest in soccer at age 8, I signed her up for the swim team. Whenever I asked her about competing in a swim meet, she said she wasn’t interested. Then, when she was almost 10, she tried out for Junior Lifeguards and came in first of all her friends in the 100-yard swim. Raising a child in the United States today means entering a world of competition that starts at an early age, and competition and team sports offer kids many positive lessons about teamwork, persistence and improving through practice, all while getting exercise and gaining physical skills. There are equally powerful negative consequences of pushing kids to compete and specialize in a particular sport at a young age, including burnout, overuse injuries and unbalanced muscle development, to name a few. 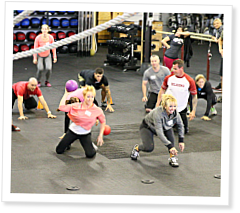 CrossFit Kids is designed to improve the general physical preparedness (GPP) of young people and set them up for a lifetime of fitness. The program is about broad, general, inclusive fitness, and making fitness fun is a major focus. Overuse injuries due to early specialization and competitive burnout that eliminates fun are obviously anathema. Gauntlet events showcase how CrossFit Kids encourages lifelong fitness through fun rather than cutthroat competition.